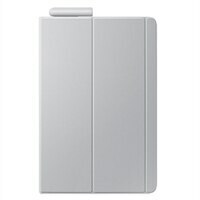 Samsung EF-BT830 Galaxy Tab S4 Book Cover - GrayThe Galaxy Tab S4 book covers feature a thin, lightweight design with a stylish soft matte finish and added corner protection to maximize the longevity and usability of your tablet. Dual usage modes make it perfect for propping your tablet up to touch with ease or standing it up to watch movies comfortably. Your S Pen is always right where you need it with the built-in pen holder attached to your book cover.